What do snack cakes, donuts and cookies all have in common? 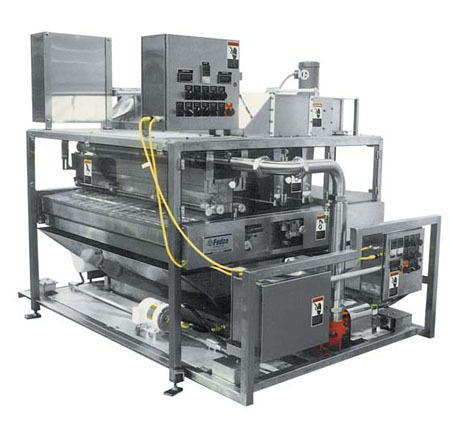 The Fedco Enrober – built by The Peerless Group – is a precision piece of machinery that completely covers (enrobe) snack cakes and other sweet/savory items. The tasty treats move the through the machine on a conveyor that inclines and declines under dual waterfalls (of chocolate – no less!) to be sure they are completely coated on all edges! To learn more this unique item and others manufactured by The Peerless Group – please visit our Website!